Much the same applies to silver as to gold, with the index suggesting that silver has further to run in the current bull rally, despite the pullback that we saw in the candle spot silver price charts last week. With the index in the low 30′ and rising, this is suggesting that the commercial traders are beginning to start selling into the rally, which should therefore continue for some time. 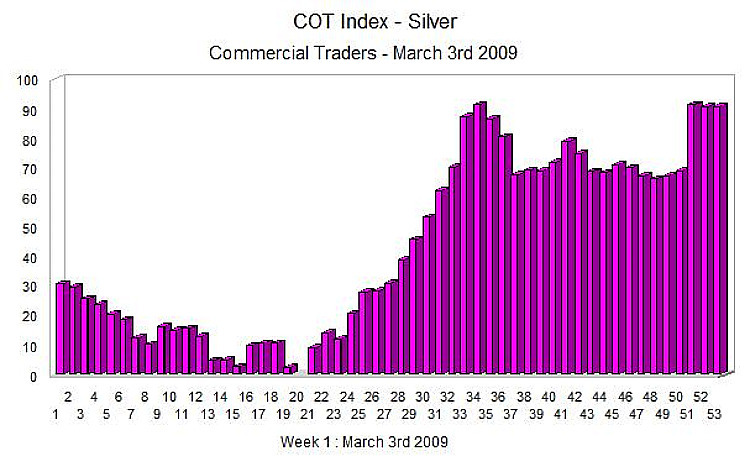 What does seem likely from the current index is that gold prices may peak more quickly than silver. We have added an economic calendar for all the fundamental news, along with a live news feed for the latest breaking news.